The New York Times bestseller—now with new material. Louie Anderson has appeared many times on "The Tonight Show", and his comedy specials on HBO and Showtime have won him wide acclaim. In this series of emotionally charged letters to his alcoholic father, Anderson reveals the sense of shame and insecurity that fuels his comic routines. 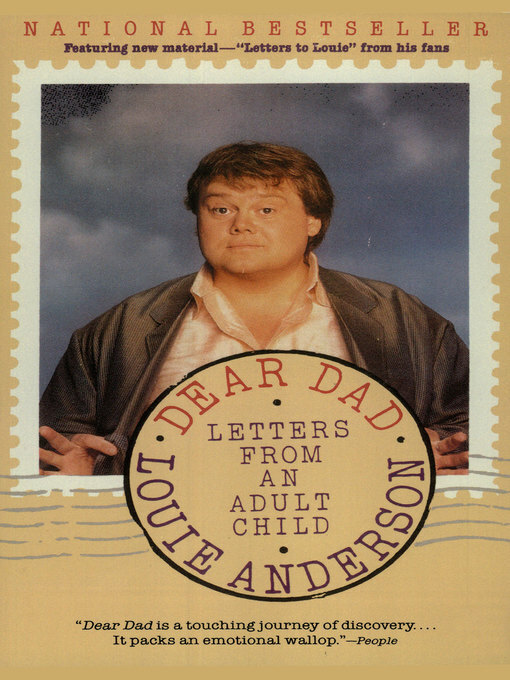 Iconic comedian Louie Anderson, the two-time Emmy award winner, is one of the country's most recognized and adored comics; named by Comedy Central as "One of 100 Greatest Stand-Up Comedians of All Time." His career has spanned more than 30 years. He is a best selling author, star of his own standup specials and sitcoms, and he continues to tour the country performing to standing room only crowds worldwide. In 2016, Louie was cast to co-star along with Zach Galifianakis and Martha Kelly in the hit FX series, "Baskets." Anderson's extraordinary new role is Christine Baskets, the matriarch of the Baskets clan. The character is based on both his mother and his five sisters, who were a major presence in his life. "I'm not as nice in the character as my mom was as a person. It really is an extension of my mom, Anderson says, adding that he always aims to make his performance "as real as possible" without "affecting or cartooning it up. It felt like it was divine intervention when I got the call to be on the show, that somehow my mom, from the great beyond, was finally getting herself into show business where she truly belonged in the first place." Sharing the ups and downs of his childhood experiences as one of eleven children in Minnesota, Louie crafted comedy routines that rang true for his early club audiences while reducing them to helpless fits of laughter, routines that led him from his career as a counselor to troubled children to the first-place trophy at the 1981 Midwest Comedy Competition. Henny Youngman, who hosted the competition, recognized the diamond-in-the-rough genius of the young comic and hired him as a writer, providing invaluable experience that soon put Louie in his own spotlight on comedy stages all over the country. Johnny Carson, the comedy icon for generations of rising stars, invited Louie to make his national television debut on the "The Tonight Show" in 1984, and the rest is history. Leno, Letterman, The Late Late Show with Craig Ferguson, "Comic Relief" and Showtime, HBO and CMT specials followed, including hosting the legendary game show, Family Feud, making Louie a household name and opening doors for him as an actor. He has guest-starred in sitcoms like "Grace Under Fire" and dramas like "Touched by an Angel" and "Chicago Hope," and he has had memorable featured roles in film comedies like "Coming to America," opposite of Eddie Murphy, and the classic "Ferris Bueller's Day Off." In 2013, he took a dive on the ABC reality series, "Splash" where he conquered his own fears while becoming an inspiration of hope. His standup Special, "Big Baby Boomer" premiered on CMT, in 2013. Also in that year, he competed and inspired on the ABC reality competition show, Splash. In 1995 Louie put his creative energies to work on the Saturday morning animated series "Life with Louie." The long-running series based on Louie's own childhood and his life with his father won three Humanitas Prizes for writing on a children's' animated series, making him the only three-time recipient of this award. It also earned a Genesis Award for its depiction of the proper treatment of animals and, most significantly, two Emmy Awards. His best selling books include Dear Dad – Letters From An Adult Child, a collection of alternately touching and outrageous letters from Louie to his late father, and Good-bye Jumbo...Hello Cruel World, self-help for those who struggle with self-esteem issues, and his latest installment on family, The F Word, How To Survive Your Family. When not in production, Louie continues to tour, traveling the States doing what Louie loves to do, Stand Up Comedy. Louie again delivers to his fans his inimitable brand of humor and warmth.